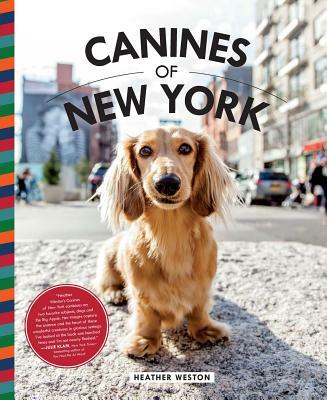 For people who love dogs and New York, this is a visual celebration of the vibrant dog community of New York City, CANINES OF NEW YORK collects more than 500 photographs taken by acclaimed Brooklyn-based photographer Heather Weston in every borough of this dog-loving city. Heather’s talent for capturing the individual personalities of these urban pooches is rivaled only by her ability to convey the essence of a dog’s life in the city, from canine commuters riding the Staten Island Ferry to regulars meeting at a Soho dog park to working dogs with jobs in the city. New York enjoys a well-deserved reputation as a dog-friendly town, and this eclectic and adorable pack of metropolitan mutts will please fans of both dogs and the city. Each dog is presented in one or more photographic portraits, with name, breed, and occasional comments from the dog’s human companion. Heather Weston is an award-winning photographer whose most recent book is Made in Brooklyn: An Essential Guide to the Borough's Artisanal Food & Drink Makers. Heather lives with her husband and daughter in Brooklyn, and is a proud ballet mom.